Wherever there is a site that is unattended, remote and exposed the FM910-4 can be relied on. Professional applications such as monitoring, telemetry, communications, isolated agricultural uses, navigation aids, military field applications, rural street lighting, remote homes and many more. The Land Tower Kit and Rigging Kit is designed for permanent installation of the Rutland 913 and FM910-3 Furlmatic Windchargers. The 6.4m overall height tower hinges at the base for easy raise and lowering and should always be supported by the Rigging Kit. Land Tower Kit... consists of 3 x 2.13m long sections of galvanised steel tubes with joiners and ready drilled to fit the windcharger and rigging kit fasteners. Tower Rigging Kit... comprises ground fixings for the pole and guy wires, steel guy wires, shackles and turnbuckles. The ground fixings should be secured in concrete bases appropriate to the terrain. 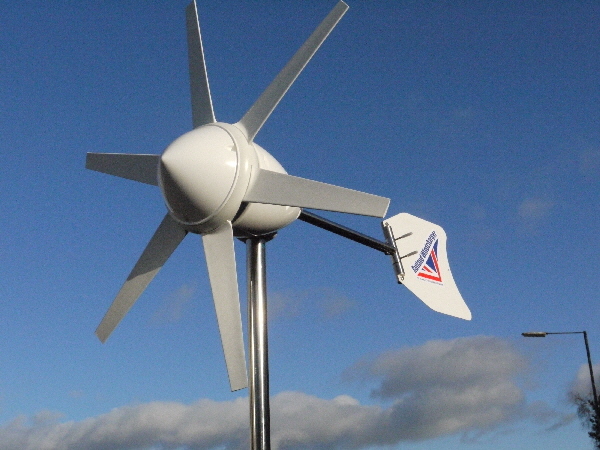 The Furlmatic model has a "furling" device that tilts the turbine horizontally at right angles to the prevailing wind at windspeeds above 35mph. This protects the turbine from the forces of excessive winds and reduces stresses on the turbine and tower.